Did you know that there is no prohibation in the Zionist Occupation State of Palestine ("Israel") against the trade of women? 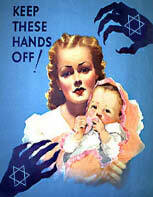 Hundreds of Slavic women are kidnapped by Jews every year from eastern Europe and Russia and taken to "Israel". Others are mislead in believing they will be given a job as a nanny, maid or other job. Those taken are placed against their will into forced prostitution rings. This is the institution of White Slavery, and it is a reality! It is time that we address this problem so as to stir up opposition to this inhumane and cruel practice.